Stephen Poulsen graduated from Fairhaven High School in 1938. He was a distinguished member of the “Greatest Generation”, who upon graduating from Fairhaven High School and following service in the U.S. Navy, went on to become a dedicated family man, as well as a renowned chemist and food technologist, inventor and successful nationally and internationally known businessman. He and his wife, Dorothy owned and operated Poulsen Consultant Services. Stephen was in the U.S. navy from 1944-45 and was promoted to Photographer’s Mate Second Class. He was honorably discharged in 1945 as a member of the “Greatest Generation”. He earned the WW11 Victory Medal set and the American Campaign Medal set. From 1961-1969, Stephen was the owner, President and CEO of C-Rich Fruit Juices in Lowell, MA with branches in Worcester, Albany, NY and Lewiston, Maine. In 1969, Stephen became the Manager of Technical Services at Sun-Maid Raisin in Kingsburg, CA. His work included an extended technical assignment in Afghanistan, where he used microbiology to research to approve raisins for export to the US. I973, Stephen and his wife started Poulsen Consultant Services and maintained that very successful business until 2002. Stephen was involved in many community programs throughout his life. In 1948-1949 he contributed much of his time and labor to a playground construction project in Riverside, CA. He was an accomplished member of the “Valley Magicians club” and performed for various charities in California. From 1957-1958, he was a volunteer for the Chicago Fire Department. Throughout his life he also served as a guest speaker for the Reedley Rotarians, he served as a volunteer tutor, helping children with reading (the children he tutored called him “grandpa” which he always considered a great honor), he volunteered at the Clovis Medical Center in California and he established the “Senior Literary Group” at the Clovis, CA Community Center to allow people to share their readings and writing interests. Stephen was also a published author of 2 writings, “Me ‘n’ Grandpa” and “The Literary Excursions of a New England Boy”. Both of these were accepted into the archives of the Millicent Library under the pen name of “Stephen Dudley”. He was a U.S. patent holder (granted 6/5/73) for Sun-Maid Raisin, “Apparatus and method for Monitoring and Recording Fumigant Concentrations in Chamber Fumigation” and he was listed in the Sun-Maid corporate news for this accomplishment. In 2003, Stephen was honored with a significant granite marker at the center of the Fairhaven High School memorial Park. He was well known for reminding everyone to “take time to smell the roses” and that reminder is engraved on the marker. In 2006 he earned the Presidential Memorial Certificate honoring the memory of Stephen for his “devoted and selfless consecration to the service of our country” signed by President Bush. Away from the athletic arenas Ray Archambault was a gentle giant. On the football field and basketball court the 6-4 giant was anything but gentle. Ray played four varsity sports during his four years at Fairhaven High School but the gridiron and hardwood sports were his specialties. In football he was a pass-catching, hard-blocking end who also served as the team’s place-kicker. And he was good enough at all three to be named the team’s Most Valuable Player as a junior and earn enough respect from his coaches and returning teammates to be named co-captain in his senior season. Among the highlights of that senior year was the role he played in a stunning 7-0 victory over a highly-regarded Attleboro team when his strong blocking and key receptions helped set up the game’s only touchdown and his successful point-after kick capped the upset win. In basketball Ray played the forward position and was the team’s “go-to” guy on offense in both his junior and senior seasons. He led the Bristol County League in scoring as a junior, pouring in 79 field goals and 27 free throws for a total of 185 points over the 19-game regular season. His nearest competitor was Leo Quegan of Coyle who finished 49 points behind. In an era where teams averaged between 20 and 30 points a game, Archambault scored just under 10 points a game all by himself. Ray led the Blues in scoring for the second straight year as a senior and was the leading rebounder as Fairhaven upset Stoughton in the opening game of the South Shore Tournament. But when a leg infection forced him to miss the quarterfinal round game, the Blues were eliminated by Abington and Ray’s high school basketball career was over. The infection was serious enough to force him to miss most of his final seasons of baseball and track as well. The popular Archambault topped the school’s List of Superlatives when he was named Most Popular and Tallest member of the senior class and after graduating from Fairhaven he served his country as a member of the 8th Air Force Division. Following his discharge, Ray returned to Fairhaven and was employed by the Acushnet Company Rubber Division as an inspection foreman for 17 years before leaving to work as a supplies purchasing agent for the New Bedford Five Cents Savings Bank. He retired in 1980. Ray was a member of the Fairhaven School Committee, a member and past president of the Fairhaven Varsity Club and the husband of Marion S. (Sylvia) Archambault. In June of 1982, Ray died unexpectedly at the age of 61, leaving his wife, two nephews and 2 nieces behind, including FHS alum Mary Lou Archambault ‘71. Robert N. Baldwin took over the boys’ basketball coaching reins prior to the 1988-89 season when he replaced the veteran Mark Southworth who had resigned to accept the dual role of athletic director and boys basketball coach at Bourne High School. For Baldwin, it was a coming home party of sorts. In the late 1970’s he was a two-sport athlete at the high school in the town where he grew up. He played some varsity basketball but his athletic career at Fairhaven High School was clearly defined by his success on the baseball field where his pitching and hitting earned him numerous accolades over the last two years of his varsity career. As a junior, the hard-hitting and throwing lefthander helped keep his Blue Devils in the thick of the Southeastern Massachusetts Conference Division 2 East race. One memorable moment came five games into the schedule when he pitched Fairhaven’s first shutout and complete game of the season, striking out seven while issuing no walks in helping his team record its fourth win in five starts. The following season Baldwin was one of the better pitchers in the area, earning Standard-Times Perfection Player of the Week honors for his four-hit pitching gem in blanking Bourne, 4-0, and for his offense that produced three hits and five runs in a 22-1 rout of Holy Family. Baldwin finished his high school baseball career - by earning a spot on The Standard-Times All-Star team thanks to his .430 batting average and impressive pitching numbers that included a 6-2 record and ERA of 1.60. Following his graduation Baldwin enrolled at Springfield College where he continued his baseball career, primarily as a relief pitcher, while earning a degree in Physical Education. He then dipped his toes into the coaching waters when he was named head coach of Fairhaven’s Post 166 American Legion baseball team. In previous summers he had coached baseball at the Ted Williams Camp in Lakeville. 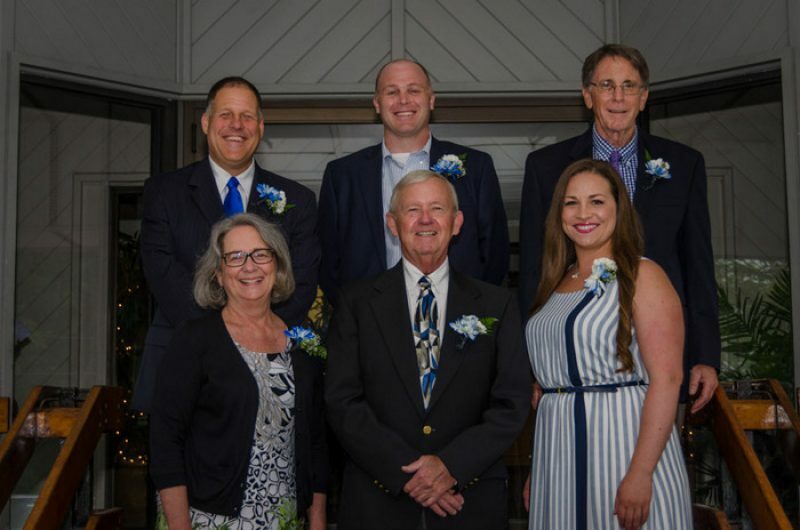 He married his high school sweetheart (Jane Collins) in 1984 and after receiving his Master’s Degree from the University of Maryland, the couple returned to Fairhaven where Jane resumed her career as a nurse and Bob accepted a teaching position in the Dartmouth school system. After two years of teaching and serving as a volunteer basketball coach under Steve Gaspar, Baldwin returned to Fairhaven High School where he was named the Blue Devils’ head basketball coach, succeeding Southworth. Baldwin’s basketball coaching career at Fairhaven lasted 12 seasons. Over those dozen campaigns he compiled a record of 149-113 including tournament games. Under his guidance, Fairhaven qualified for the postseason tournament eight times. Nine of his teams finished the season with double-figure wins, only three had losing records and none won fewer than eight games. His best season came in 1990-91 (Baldwin’s third year with the team) when the Blue Devils finished the regular season at 16-4 and advanced to the South Sectional Tournament semifinals before being eliminated. Bob’s last season was 1999-2000 and his players said thank you with a record of 18-4, the most regular season wins by any team he coached. With his coaching career in the rearview mirror, Baldwin looked ahead to his educational goals serving as a vice principal at the Hastings Middle and as principal at Middleboro High School, he was later appointed Superintendent of Schools in Fairhaven, a position he continues to hold. Ryan Powers was a phenomenal three sport athlete, playing four years of soccer, basketball, and baseball. He earned the captain spot on all three teams his senior year. According to basketball coach Bob Baldwin, “Ryan epitomized what working hard can do” and according to all his coaches nobody worked harder than this young man! Whether during practice or battling in a game, Ryan always gave 100%. According to the late “Mr. Del”, “If ever an example of what a high school player should be, Ryan Powers is it! From start to finish, he exudes intensity and leadership. He is all game, he is all business”. Ryan was the blood and guts of his teams and always led by the only way he knew, by example! His hard work and determination to succeed, along with fellow star Dustin Botelho, helped his 1999 basketball team become the first EVER outright SCC Champions! FHS has been co-champs on different occasions but this was the first individual one. The Blue Devils compiled a 13-3 record which could have, very easily, been even better as it’s only losses were a 1-point decision to Bourne, and 2 overtime losses to Wareham. Ryan’s numbers spoke for themselves that season: 51% shooting from the floor, 232 rebounds, 13.5 points per game average, but it was his “all out-all the time” effort that may never be replaced. Powers was a four year starter on the soccer team, and kicked off a great freshman year scoring many goals and being a powerful addition up front. In baseball, Ryan was the starting center fielder whose all-out play in the outfield produced some fantastic defense. Although he did not have the best batting average on the team, his powerful and timely hitting always seemed to come at the most opportune time, including a powerful grand slam in the fifth inning in a game against Dighton Rehoboth, which allowed FHS to hold on to an 8-6 SCC victory. His hard work and gutsy play earned him several awards, players of the week and All-Star nods. As a basketball star Ryan was nominated for the Dave Cowen’s Award. He also received the Mel Entin Athletic Award-1999, Athlete for All-Seasons Award, The Drew Foster Defensive Player of the Year Award-1999, Blue Devils Classic All Star Award, Most Valuable Player Soccer-1999, SCC All Star in soccer-1998 and 1999, in basketball: SCC All Star, 1998 and 1999, Standard Times All Star 1998 and 1999, Boston Globe Player of the week and Honorable mention All Star in Baseball. Ryan graduated with a Bachelor’s Degree in English in 2004 and Master’s Degree in Elementary Education in 2007 from Bridgewater State University and has been teaching fourth grade at Acushnet Elementary School since 2005. He lives in Fairhaven and you will still find him running local road races and many very long and difficult 50K trail races. Heather was born in New Bedford and raised in Fairhaven. She attended Wood Elementary School, Hastings Middle School and Fairhaven High School. She continued her education and soccer career at Simmons College graduating in 2012. Heather was an outstanding student with a GPA of 3.01 and a three (3) sport athlete earning letters in basketball, track and soccer. Heather earned various awards such as a FHS Scholar Athlete Award as a junior, a FHS Community Service Award in 2004; and Certificates of Recognition for being named to the Girl’s High School Soccer & Track Super Teams. Heather was basketball MVP in Tournament games against New Bedford and Case High Schools. During her high school career from 2001 - 2004, Heather was named as a South Coast Conference (SCC) All-Star and/or to the SCC Super Teams for Track and Soccer more than once. She was named Honorable Mention to the 2003-2004 SCC Basketball All-Star Team. She led the Blue Devils basketball team in rebounding with over 12 per game, despite standing just 5’ 6”. Dave Brogioli, her coach, said, “the Sophmore power forward has plenty of upside and considers her one of the top defensive players for Fairhaven.” Heather averaged 3.1 steals per game. This excellence of performance continued in her Junior and Senior years. She was always assigned to guard and frustrate the opponents top low post scorer. Heather was named the S-T Girl’s Basketball Player of the Week several times during her career. Heather was outstanding in track doing the javelin, and the only SCC qualifier for the State Meet in 2004. In 2004 she was the State Champion with a throw of 115’ 6” and finished 8th in the New Englands with a throw of119’ 5”. A versatile scorer, Heather was part of the long jump team, did the high jump, discus throw, 200 and 400, meter dash, 400, 800, and the 1600 meter relay. She excelled in the javelin and finished 1st or 2nd in dual meets and more than held her own at the State Meets. Heather continued to improve in the javelin going from 69’ 0” as a Freshman to 122’ 3” as a Senior and in the discus from 78’ 3” to 87’ 5”. The week before one of the dual meets she was told to practice the High Jump, an event she’d never done before. She cleared the bar (not an easy thing to do) and scored points for the team. Heather and her sister Jamie were a major reason the team won most meets. Heather excelled as a midfielder in soccer. Her coach Sam Galvin said, “Tapper could have played anywhere for us. She was a very versatile and unselfish player with a great knowledge of the game and she’s a real tough competitor. She made a lot of good things happen for herself and her teammates with hard work and determination.” Heather and her sister Jamie were a Dynamic Duo and unstoppable on the soccer field. Heather was captain in 2004. Heather was a special Student Athlete who improved her performances each year from Freshman to Senior and found time to maintain a 3.01 GPA. The result of her Academic and Athletic performances was to be one of two (2) seniors awarded to have her name placed on the Mildred Parkinson Tunstall Cup. Randy Leisey moved to Fairhaven at the start of his freshman year and immediately fit right in to the Fairhaven High School student body and community as a whole. In his years at FHS, Randy was on the football and basketball teams all 4 years and the spring track team for 3 years. Randy’s football team suffered through three losing seasons until his senior year, when he was chosen as the team’s captain. After losing the first few games of the season, Randy’s team went on to win the next few games (with one tie against a tough Plymouth- Carver team). Randy was selected as the Standard Times player of the week for his win against Barrington and his key role in the come from behind victory. The Standard Times stated, “Leisey scored on a 67 yard TD pass, played a bang up defensive game and did his usual stellar job punting”. FHS and Leisey were able to win the last 2 games of the season, even beating Dartmouth after losing for 8 straight years. It was another come from behind win, securing a winning record (4-3-1) for the first time in 8 years. Randy was selected by the Standard Times for the All-Scholastic Football team, nominated by his coach who stated, “Randy has a way of getting into an opponent’s secondary and he was especially valuable as a pass receiver”. The Taunton Gazette also selected Randy as a member of the All-Bristol County team and the New Bedford Quarterback club honored him as one of three scholar-athletes at their annual banquet. In the basketball 1965-1966 season, Randy served as team captain and led his team to an 11-6 overall record, narrowly missing qualifying for the MIAA state tournament. As a third year varsity starter, Randy led the team in scoring and rebounding and consistently scored double figures. At 6’4”, he was described as a defensive presence in the middle that intimidated the opposition”. In what was described as his “best game of the season”, Randy “poured in 25 points and did a bang up job on the boards” against Bishop Feehan where FHS was able to win 58-46. At the end of the season, Randy was selected by the Anchor Newspaper (Fall River Archdiocese) as a member of the Class A All-Star Basketball Team. Randy also lettered on the Spring Track team as a junior and senior, excelling in the low hurdles and high jump. These teams were very competitive on the local and state level. At the FHS Athletics Awards ceremony, Randy was awarded the Principal’s trophy and the Sparrow Cup. Following graduation, Randy attended Bucknell University and went on to the Lancaster Theological Seminary. He earned his doctorate in Theology from Drew University in New Jersey. He later retired from the ministry and settled with his wife Beverly in Cody, Wyoming.